There are a few Italian treats I like. Crunchy biscotti with coffee, moist and sweet tiramisu, vanilla panna cotta and gelato. 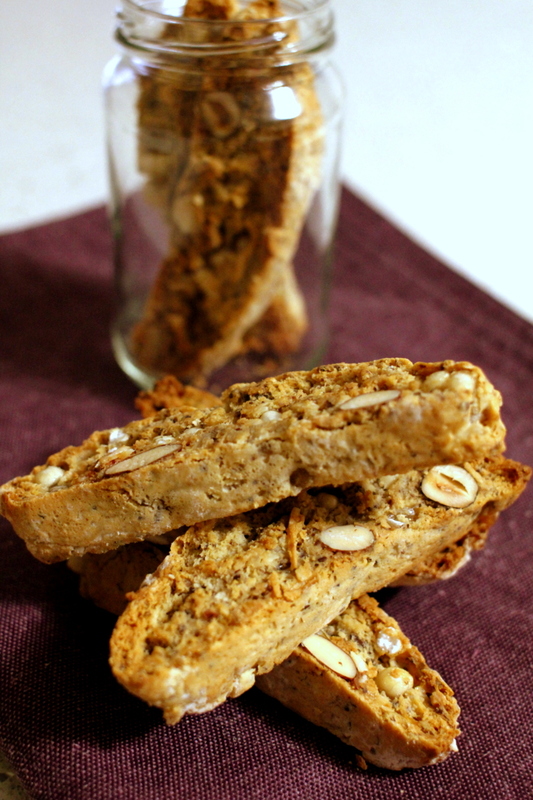 Especially having a cup of coffee and you feel like something with it.. biscotti is just perfect indulgence. You can even have for your breakfast. Nothing wrong with that! Have you tried with wine? Maybe you should! It’s super easy to make your own version at home. You can make gluten free, egg free and sugar free – it doesn’t mean you can have a whole jar of these yummy cookies though! I used coconut cream, dessicated coconut, rice flour, LSA, honey, a pinch of salt, baking soda, baking powder, vanilla extract, almonds and hazelnuts. I didn’t follow recipe or anything, so cannot remember exact amount of ingredients I put in there. When you make a healthier version of bread, muffins, cookies etc, you can use substitutes. Make your own spin on the basic recipe! Personally I use coconut products, fruit, tofu and maple syrup in my baking. I find it tastes better for me (maybe worse if you like overly sweet and rich buttery flavour). It doesn’t sacrifice yummy taste, but heaps better for your body. mmm…list goes on…You can add a bit of liquor for adult’s version as well.